Leh,April 15 (Scoop News)-With an aim to ensure maximum electorate to vote on 6th May, SVEEP team conducted a voter awareness drive and EVM/VVPAT in Hemis village today. The drive was organized at Hemis community hall in the presense of SDM, Kharu. The audiences were both villagers and monks of nearby monasteries and were quite curious to know about the functioning of newly introduced VV PAT. After having deliberations and discussion on the importance of voting, a live demonstration on mock poll was conducted to make the electorates fully understand about the voting process on the polling day. 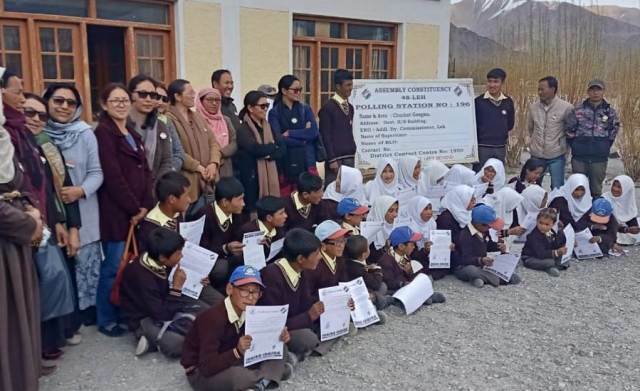 Another team of SVEEP Leh has disturbuted Sankalp Patras to students of different schools in Leh. The students were asked to get the pledge letters signed from their parents or guardians. Sankalp Patra is an initiative by Election Commission of India to intensify voter awareness through school children to enhance voter’s participation.